Beige holestone of very good quality. Cleaned. 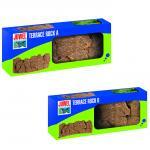 Ideal for cichlids aquariums. Hand selected stones in various pack sizes. Very light and porous lava. Rough and pitted surface. Mainly for freshwater aquariums. The lava is very economical. An 8 cm large stone weighs only about 300g. Attraktive Terrassenmodule für einen strukturierten Aquariumaufbau.